Tom Putt is an old English cider variety, which can also be used for cooking. 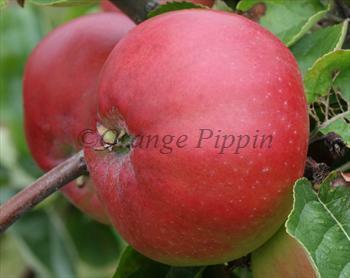 The fruit size is quite large for a cider variety, and the sharp flavour mellows when cooked. Please fill in the details below and we will let you know when Tom Putt cider apple trees are back in stock. Tom Putt is in flowering group 3. Tom Putt is a triploid variety and cannot pollinate other varieties. It needs to be pollinated by another tree of a different variety nearby. You can either plant a self-fertile variety (which will pollinate itself and the Tom Putt) or you can plant two pollination partners which must each be of different varieties and able to cross-pollinate each other as well as the Tom Putt. If you need further advice on this just get in touch. Since it flowers in the middle of the blossom season it can be pollinated by most other cider apple trees. Like all cider-apple varieties it can also be pollinated by most other apple varieties or crab-apples flowering at the same time. Like many old varieties, Tom Putt has good natural disease resistance. Thought to originate in Somerset or Devon, in south-west England, in the late 18th century.